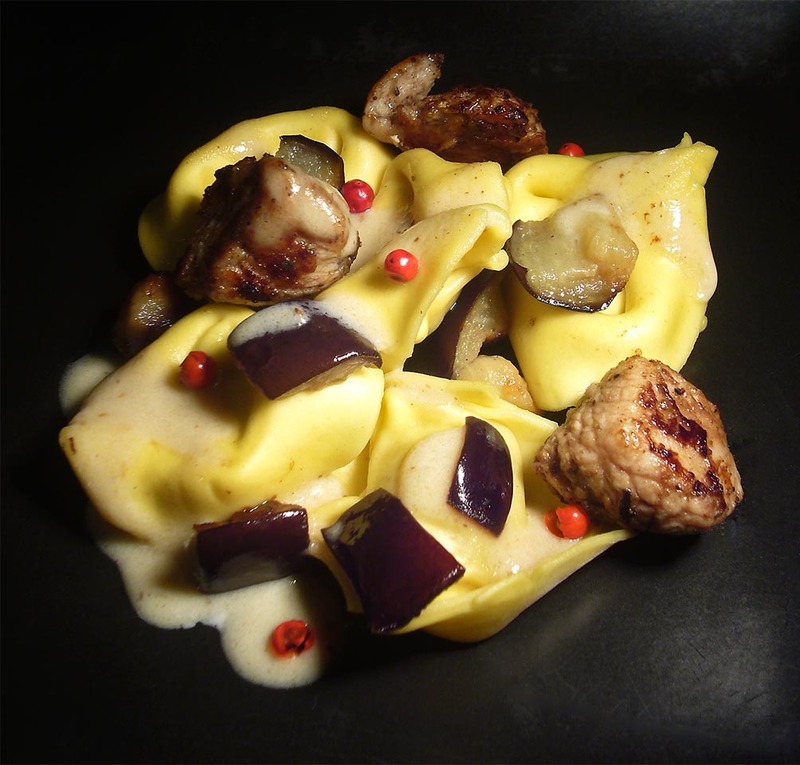 Recipe Taster: TweetPost #4: Tortelloni with Eggplants, garam-masala turkey nuggets and a long peppercorn scented milk-olive oil emulsion sauce. TweetPost #4: Tortelloni with Eggplants, garam-masala turkey nuggets and a long peppercorn scented milk-olive oil emulsion sauce. Yesterday night I came back home a bit earlier than usual and I was so hungry that I took a big chunk of bread, made some olive oil and lemon juice emulsion and married the two together over and over again. Naturally, at dinner time I wasn’t starving as usual. That is a good thing since I then have more energies to invest in something worth posting and so I came out with the recipe you will read in this post and spend most part of the night shooting pictures before realising that it was almost 3am. 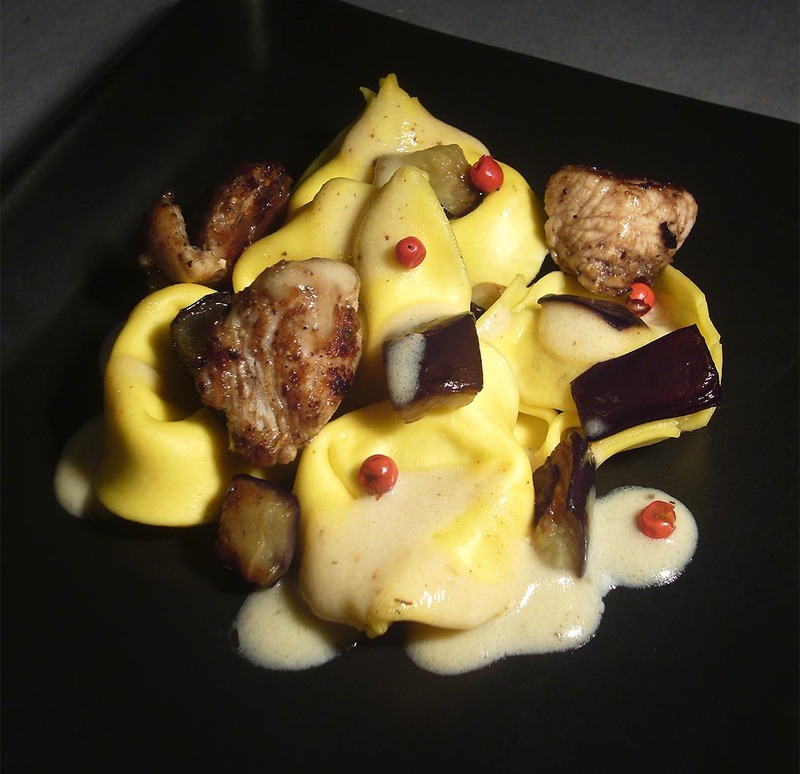 Tortelloni with Eggplants, garam-masala turkey nuggets and a long peppercorn scented milk-olive oil emulsion sauce. In a small saucepan put the milk with the lecithin and the crushed long peppercorn; warm it up on the hob and let it infuse for 15 min or so. In the meantime sprinkle the diced eggplant with some salt and let it stay in colander for 15min so to lose some of its bitter waters and it won’t soak up much oil when shallow fried. Now it is time to marinate the turkey. In a small bowl put the diced turkey with the garam masala, 1teaspoon of cornstarch and a sprinkle of salt and black pepper. Massage well the mixture so to coast the meat properly with the spices, add then a splash of balsamic vinegar and massage the whole again. Let the meat marinate for 15min or so. In a big pot, put some water for the tortelloni and bring it to a boil. When it will boil, salt it and cook the tortelloni as indicated in the package. Rinse the eggplants under running water, squeeze them with your hands and lightly dry them with paper towels. 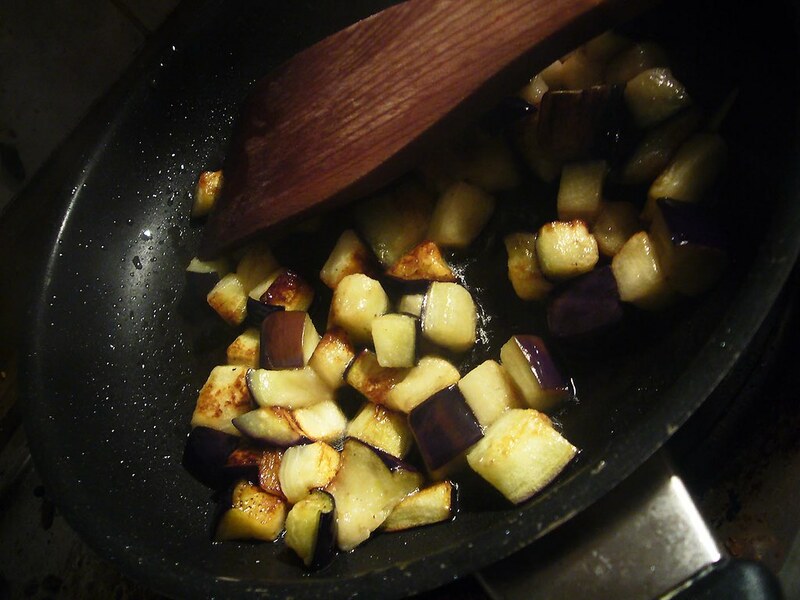 In a small skillet, bring then some canola oil to frying temperature and shallow fry the eggplants. 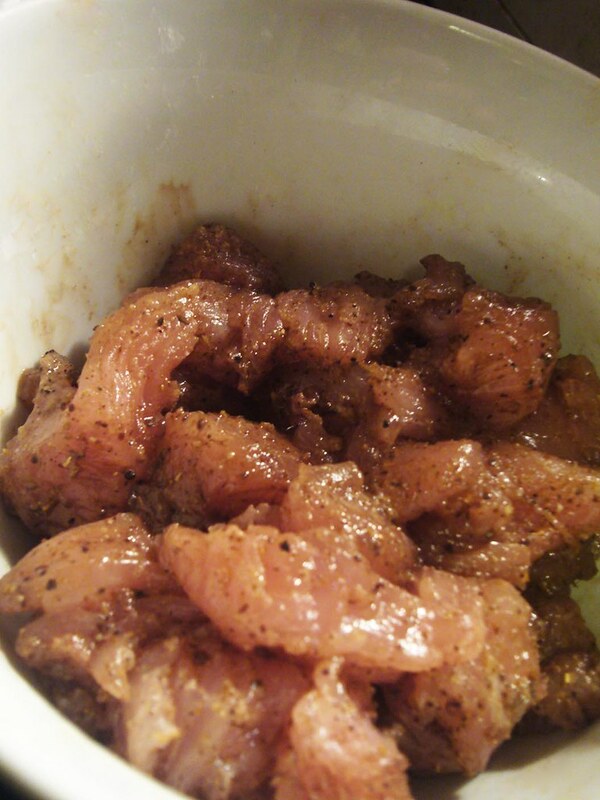 When browned and ready, transfer them on a sieve to drain the excess oil. In the same skillet, sauté the turkey till nicely browned. Set aside. Dissolve the other teaspoon of cornstarch in some cold water, bring the milk and peppers to simmer, add the olive oil and whisk properly to emulsify the two. 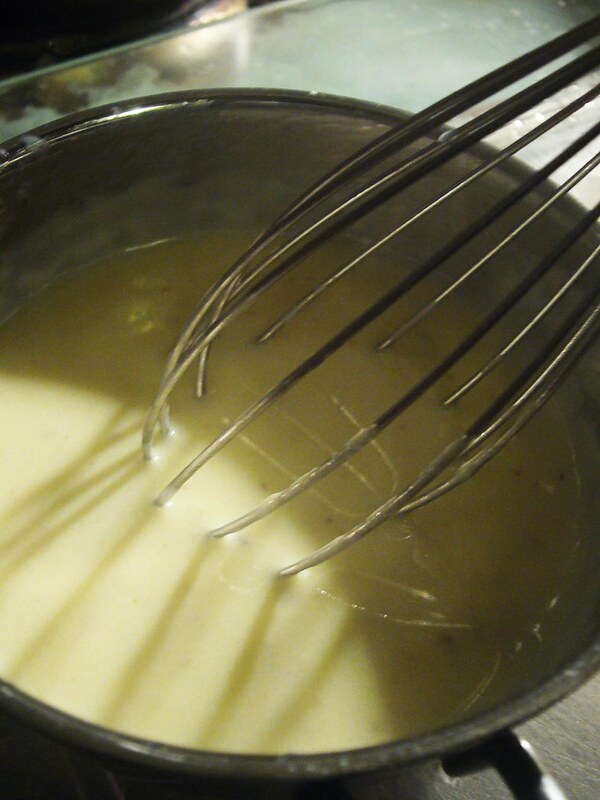 When the emulsion will be formed start dropping little by little the cornstarch slurry, always whisking, till you obtain a creamy consistency. Salt it to taste. At this point your dish is ready to assemble. 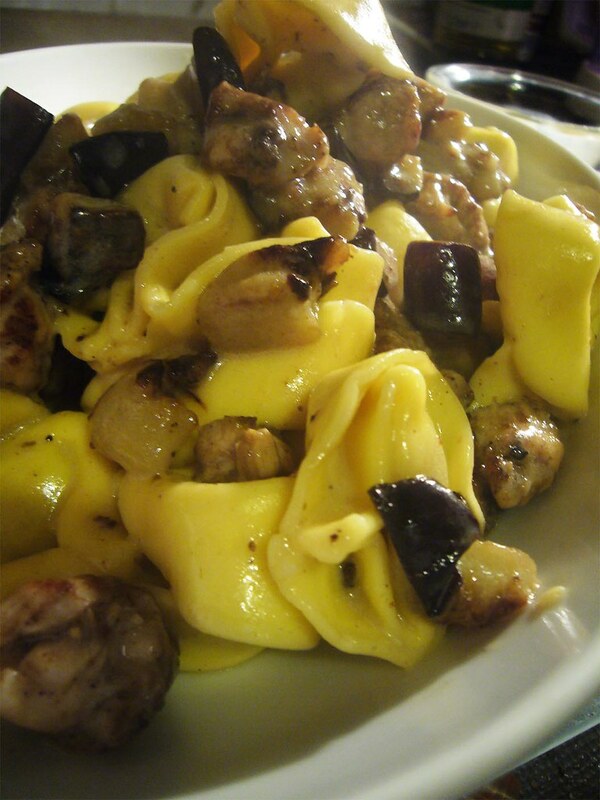 To the drained tortelloni add the egg plants and the turkey nuggets; stir carefully to mix them together. Dish the tortelloni and nappé them with the sauce. As further enhancement you might sprinkle few pink pepper grains over them and a bit of grated Parmiggiano Reggiano. Thanks Sunita for your great home made garam masala! OH yum!!! and yes Sunita's grasam masala is so awesome. 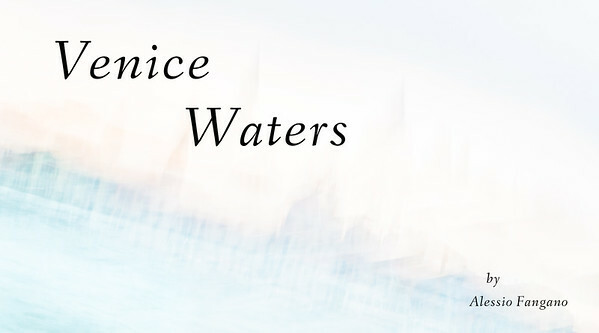 :) This is a beautiful dish. I can never be bothered to cook once I come home. tired and cold. :( u put me to shame! @dive Never my friend! I know your feelings, sometimes I'm so lazy and tired that I grab junk-food from the supermarket right underneath my apartment but I need to care for my old skin (otherwise big depression awaits lol).